Errol Persaud, P Eng, Education Consultant with CTAB, presented the awards to CNA-Q President Dr Khalifa Nasser Al Khalifa at a ceremony at the College premises yesterday. The certificates were awarded to the three-year diploma programs of Process Automation Engineering Technology, Electrical Engineering Technology, Mechanical Engineering Technology, and Chemical Processing Engineering Technology. 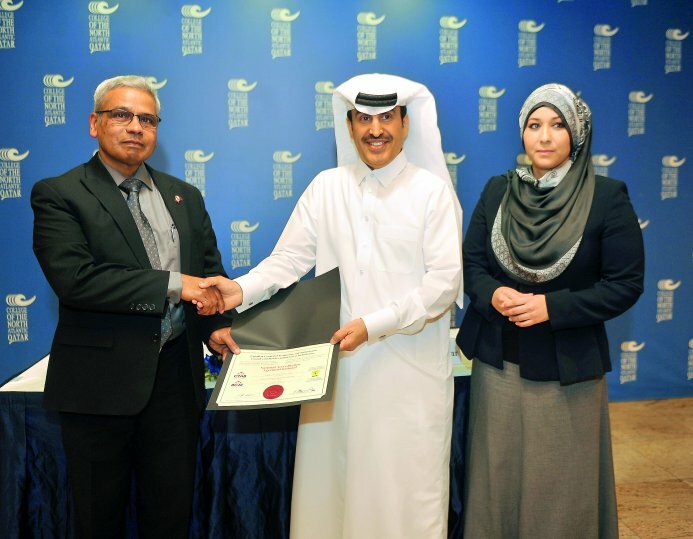 “These accreditations are extremely important for CNA-Q, they validate the excellent work we are doing here at the College, and serve as a reminder that CNA-Q is an internationally recognized technical college, preparing CNA-Q’s students to be trained as innovative problem-solvers and technically competent workers who strive to meet Qatar’s evolving economic needs,” said Dr. Khalifa. “The accreditations are from a professional and certifying body that allowed students to have their position recognized,” Samah Gamar, Vice President - Academic CNA-Q told The Peninsula on the sidelines of the event. She said that it is professional certification that allows students to be able to claim that they are graduates of an accredited programe as it is not only an academic accreditation because all CNA-Q programs are accredited already by the Ministry of Education and Higher Education. “This is third external body that recognized the scope and level of professional skills up to an international standard,” said Gamar. The Process Automation Engineering Technology program has been re-accredited for a second time until 2020, and the Electrical Engineering Technology program has also been re-accredited until 2020. The Chemical Processing Engineering Technology program secured its first accreditation until 2021; and finally, Mechanical Engineering Technology also has garnered accreditation from CTAB until 2021. Established in 1982, the CTAB is a standing committee of the Canadian Council of Technicians and Technologists (CCTT). The board is charged with developing, coordinating and managing the national accreditation program for applied science and engineering technology programs internationally. Since its inception in 2002, CNA-Q has grown to offer 30 diploma and certificate programs, graduating thousands of students from full-time programs who have populated the workforce in Qatar or pursued further education.